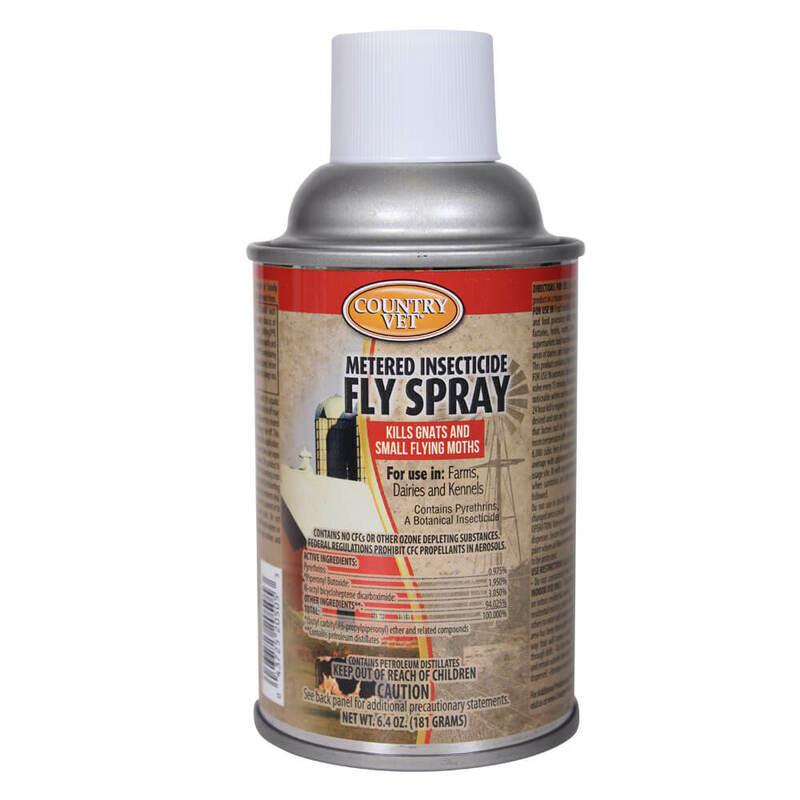 Country Vet® Metered Insecticide Fly Spray can be used in food handling and preparation areas of restaurants and food processing plants, stores, farms, dairies, barns, kennels, factories, schools, hotels, motels, offices, ships, planes, supermarkets, food warehouses, bottling plants, hospitals, nursing homes, day-care centers, milk and egg handling areas of dairies and chicken houses. Kills flies, mosquitoes, gnats and small flying moths. Kills and repels flying insects. For use in metered spray dispenser. High quality, economical automatic flying insect control. Contains 0.975% Pyrethins from Chrysanthemum flowers for effective flying insect control. This product contains chemicals including, 4-allylveratrole, which is known to the State of California to cause cancer, birth defects or other reproductive harm. (California law requires this warning to be given to customers in the state of California) For more information go to www.P65Warnings.ca.gov. Bug Killer: This product contains highly effective insecticide designed especially for use in automatic dispensers. The dispenser activates the 59 mg metered valve every 15 minutes. Usually the effectiveness of this product will be noticeable within one hour after the dispenser is activated. If less than 24 hour control is required, the dispenser should be set to start one hour before control is desired and run one hour after control is no longer needed. Keep in mind such factors as airflow rate, size of space treated, humidity and room temperature all affect insect activity and control. Therefore, one unit per 6,000 cubic feet should be considered as an average need with adjustments made depending on specific conditions at place of usage. As with any method of insect control, best results are achieved when sanitation and other positive insect prevention practices are followed. It is suggested that the container be changed once a month. Do not use in aircraft cabins. *Equivalent to 1.56% (butylcarbityl)(6-propylpiperonyl) ether and 0.39% related compounds. Contains petroleum distillates. Contains no CFC's or other ozone depleting substances. Bug Killer: Hazards to Humans and Domestic Animals: Do not use in nurseries or rooms where infants, ill or aged persons are confined. Do not install directly above or within 12 feet of any food handling or dispensing area. Metering device must be timed so that it does not dispense while food processing is underway. Foods should be removed or covered in such a way as to prevent contamination. All food processing surfaces should be covered during treatment or washed with an effective cleaning compound followed by potable water rinse. If Swallowed: Call a physician or Poison Control Center immediately. Gastric lavage is indicated if material was taken internally. Do not induce vomiting. Vomiting may cause aspiration pneumonia. If Inhaled: Remove victim to fresh air. Apply artificial respiration if indicated. If on Skin: Remove contaminated clothing and wash affected areas with soap and water. Get medical attention of irritation persists. If in Eyes: Flush eyes with plenty of water. Get medical attention if irritation persists. Do not allow spray to contact plastic, painted or varnished surfaces. Contents under pressure. Do not use near heat or open flame. Exposure to temperatures above 120°F may cause bursting. Do not puncture or incinerate container. Storage: Store in a cool, dry area away from heat and open flame. Disposal: This container may be recycled where steel aerosol can recycling is available. Before offering for recycling, empty the can by using the product according to the label. Do not puncture! If recycling is not available, wrap the container and discard in the trash.